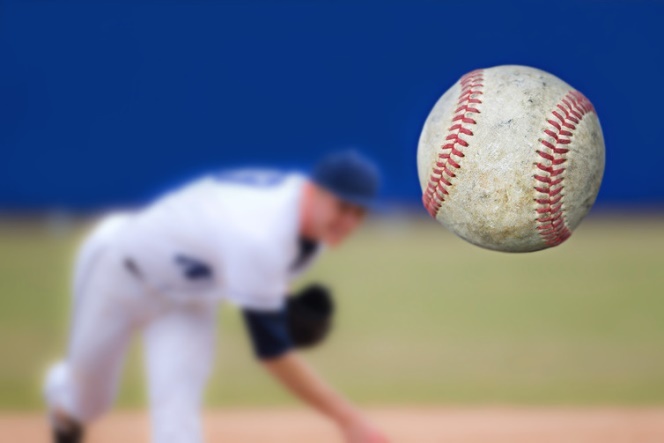 Throwing injuries in young baseball players: Is there something we are not considering? A baseball en route from a pitcher’s hand. Baseball marks the end of winter and the start of spring, and we as a nation delight in watching not only the pros but also our kids play this great gameUnfortunately, we sports medicine doctors are seeing an increase in injuries to the throwing arm in youngsters, and many of these require surgery. Most worrisome is that the risk for developing a throwing injury was shown to increase by 36 times in adolescent pitchers who continued playing with a fatigued arm.As a sports medicine physician and a former collegiate baseball player, I am concerned about this rise in injuries. They not only take a youngster out of commission for a game or season, but they also can have lasting effects. My team of researchers at the University of Florida is looking for ways to prevent arm injuriesToo many pitches during games a possible factorrnThe majority of injuries in overhead throwers occur in the throwing arm. When including pitcher and position players, anywhere from 51 to 69 percent of all reported injuries occurred in the throwing armIncreased awareness about the injuries could be a factor in the projected slowdown of surgeries. Greater awareness could lead to increased reporting of the injuries from the pre-internet era until nowIn addition, attention to the reporting of Major League Baseball injuries creates consciousness by young players, coaches and parents of the growing concern of these overuse throwing injuries.There is more to the increase than just more reporting, however. A more serious reason in higher usage of the throwing armFor example, during the Koshien Baseball Tournament in Japan, a study of Japanese high school-aged pitchers showed pitch counts greater than 150 pitches in multiple pitchers, with a high of 187 pitches – for one pitcher – in 2016.And in Kansas a high school pitcher attracted national media attention in 2016 by pitching 157 pitches in one gameSurgeries to reconstruct a frequent injury to a ligament in the elbow of the throwing arm – also known as Tommy John surgery – have been increasing in baseball players at all levels of play for the past 20 years. One study showed about a 9.5 percent increase per year from 2007 to 2011Unfortunately, data suggest that this trend toward more Tommy John surgeries, which reconstruct the ulnar collateral ligament(UCL) in the elbow, is not likely to decrease until at least 2025And maybe too many pitches before games?rnIt is important for parents, players and coaches to be aware of simple methods to prevent these overuse injuries. Some approaches include not playing on multiple teams at the same time and throwing restrictions, such as taking a day of rest based on the number of pitches thrown. Also, players should keep their rotator cuff strong and never pitch if an arm is in pain.However, these actions have not reduced the number of overuse throwing injuries given the growing number of injuriesThus, there has been an increased emphasis on pitch restrictions, particularly at the youth and high school levels. Originally, Little League Baseball and the USA Baseball Medical Advisory Committee (USAB-MAC) developed pitch count restriction recommendations based upon ageMore recently, Major League Baseball developed PitchSmart, a website that provides information to players, coaches and parents to prevent overuse injuries in youth and adolescent pitchers. As of 2016, the National Federation of State High School Associations began requiring a pitching restriction policy in each state based on the number of pitches thrown in a game, not based upon innings (which was previously used)One interesting aspect of the pitch restriction recommendations is that there is no consideration for number of pitches thrown in the bullpen or during before-inning warm-ups. Players may therefore be considered in the “safe” zone of pitches thrown when compared to state guidelines – when in reality, the pitching volume and unaccounted workload including the bullpen and before-inning warm-up pitches would be significantly higher than recommended.With that in mind, our team at the University of Florida began considering the actual number of pitches a pitcher throws in each high school game. Our theory is that there is an unaccounted workload factor right in front of us.While our study’s data are ongoing, initially we have found it is very typical to have a pitcher throw 70-80 pitches in a game but actually “pitch” more than 120-130 pitches if we include the bullpen and between-inning warm-ups. We should note we are not looking at injuries at this time, as this is an observational study onlyIt should also be stated that while there is significant variation in bullpen warm-up volume, it is our opinion that it would not be appropriate to “regulate” how a pitcher warms up as every pitcher has his or her own style to feel comfortable prior to entering live game competition.However, our study thus far shows that there is significant variability in the number of bullpen pitches thrown, varying from less than 20 pitches to more than 50 pitchesOne unanswered question is that if there are now pitch limitations but there is a certain percentage of pitches unaccounted for, do we need to train our pitchers differently? Given that an increase of early season throwing injuries is potentially due to not training appropriately in the off-season, our study reinforces the importance of a preseason pitching program to ready the arm and body for the coming season.The ultimate goal of our study is to is prevent throwing injuries before they happen in our adolescent pitchers. Our hope is that years from now, the number of overuse throwing injuries will decrease, allowing our youth and adolescent overhead throwing athletes every opportunity to enjoy America’s pastime on the field of play, not in the doctor’s office.